There was lots of room for improvement, however, and you'll find these improvements in our heads. We started by upgrading the hook and downsizing it slightly. I simply can't stand dull hooks, so we found the sharpest hook we could, the Eagle Claw 413 saltwater jig hook. We use a Size 1 for the 3/16th oz. and a Size 2 for the 1/16th oz. The gap is the same as all the standard jigs, but the overall length is downsized. We downsized the hooks to better imitate what bonefish eat, and to make them land as quietly as possible. 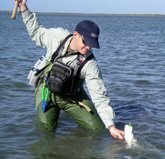 Fly fishermen have been catching bonefish for years on small flies, because they work! You can still tie these up like gobies, toadfish, or blennies for a larger profile, but they'll tie small when the conditions call for it. Speaking of stealth, these guys land more quietly than anything on the market! For those calmer days and shorter casts, we offer our bonefish jig heads in 1/16th oz. When you tie them up, especially when you tie with bunny, you'll get a little more weight to help you cast the jigs. But the lead is only 1/16th oz. Not as quiet as a mouse going on cotton, but darn close! For the standard size bonefish jig head, the 3/16th oz., you'll see we used a hidden lead technique to make it land softly and keep the profile small. You won't find this anywhere else, and it typifies our commitment to creating the most unique and effective jig heads on the market! And when you get up in this size range, you also get a lot of crossover to saltwater species further North. 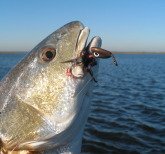 They make fine redfish, speckled trout, snook, and flounder jig heads! Head to the Online Store and look for the Buggs Bonefish Jig Heads tab. 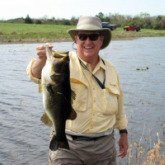 I know lots of kayakers and guys who fish from poling skiffs who get close enough to fish to target them with 1/16th oz. jigs. Bottom line: What you have here are the most unique and effective bonefish jig heads ever made! But don't just take our word for it, head to the online store and pick some up today! You can also find tying instructions for the Buggs Bonefish Collection so you can tie them just like we do!